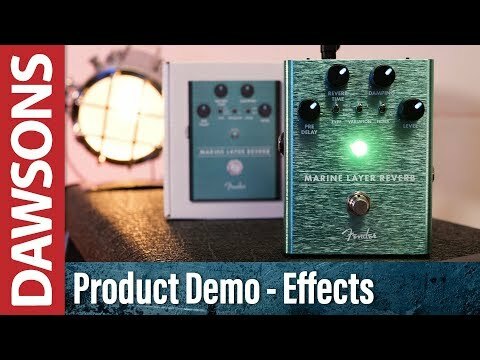 The Fender Marine Layer Reverb Guitar Effects Pedal brings the wonder of reverb to your tone shaping arsenal, a much needed and coveted effect that all guitarists love. From subtle slapback to enveloping soundscapes, reverb allows you to make any space your own, infusing your tone with a dreamy energy. The Marine Layer Reverb is packed with a range of types to suit your performance, playing environment, and style. The Marine Layer Reverb control layout across the top gives you directly accessible dials and knobs that allow you to dial in your perfect tone. You'll find controls for Pre-Delay, Reverb Time, Damping, Level, Type, Variation, and Filter. The breadth of versatility at your fingertips is truly remarkable, and you'll never tire of tweaking and twiddling to find your perfect sound. The Marine Layer Reverb has been designed by Fender's very own in-house experts, based on a wholly original design. Taking on board data received from a wealth of players in the design process, the Marine Layer Reverb is designed to be as stage-friendly as possible. The chassis is built using lightweight, durable anodized aluminium, which is finished in a beautiful green. There are single instrument inputs and outputs, as well as two possible power supply options. There is a 9V DC input, or you could go with a 9V battery, which is accessible via Fender's "patent applied for" magnetically latched batter door for quick and easy battery changing. The amp jewel LED upholds classic Fender style, whilst the cleverly designed LED-backlit knobs show your control settings clearly, even on the darkest of stages.